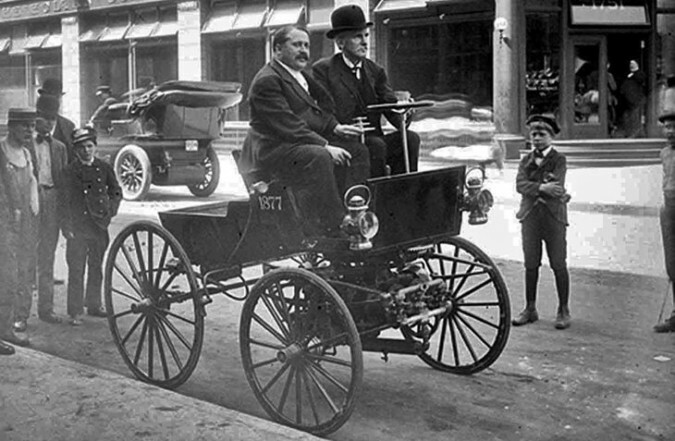 On this day in 1893, brothers Frank and Charles Duryea debuted the first ever car on American roads. The car, which was fondly referred to as the “Buggyaut,” was first seen on Taylor Street in Springfield, Massachusetts’ Metro Square amidst a crowd of disbelieving eyes. The vehicle was a one-cylinder creation that ran strictly off of gasoline. The mechanics of the machine was designed by brother Frank, while Charles is credited with the vehicle’s aesthetic design and providing the capital to get the project off of the ground. Unfortunately, this was the only creation coming from the brother duo. After the vehicle debuted, the two battled over who should get credited with the vehicles creation. The rift became so bad that the two eventually split and created separate car building firms, each gaining only moderate success. Despite never building off of the success of the Buggyaut, the vehicle still remains as a monumental piece of American history, a forefather of Ford and GM. That is why it should be no surprise that it is currently being housed in the Smithsonian for all of the world to remember and praise. This entry was posted in Culture and tagged 1893, Buggyaut, Charles Duryea, Frank Duryea, Massachusetts, Metro Square, one-cylinder, Springfield, Taylor Street. Bookmark the permalink.